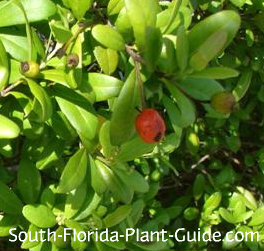 Simpson's Stopper or "Twinberry" is a shrub that makes everybody happy - with flowers that attract butterflies, fruit that birds enjoy, and the ease of care that homeowners love about this South Florida native plant. One of the best wildlife plants for our area, this plant is cold hardy, salt tolerant, drought-tolerant once established and grows slowly so maintenance is at a minimum. The small white fragrant blossoms appear on and off all year. The bloom is heaviest in spring, with pretty white flowers decorating the plant. After the flowers comes the fruit...bright red berries that are a favorite of the mockingbird (Florida's state bird), blue jay, and cardinal. Shrubs with berries can make a mess but in this case the berries are tiny and quickly consumed by birds...and they're edible people-food as well. This is a wonderful shrub or small tree for sun or shade...there are actually benefits to both types of light. In a sunny location the leaves grow dense and the plant takes on a full shape. In more shade the foliage is less dense, showing off the attractive smooth bark on the trunk. 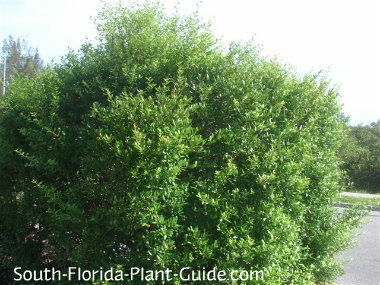 You can keep this shrub sheared to 6 to 8 feet as a hedge or let it grow larger (as much as 20 feet) as a multi-branched small tree. The name "stopper" is believed to refer to the legend of Indians using the fruit to stop diarrhea. An alternative meaning is that these plants form a "thicket" that stops people from passing through them. Simpson's stopper works anywhere - whether kept well-manicured for a formal landscape or left to grow in a more natural form for a casual design. It makes a great ornamental tree for a small yard...though you might want to buy a bigger plant to start with, since its growth rate is fairly slow. Its salt tolerance makes it perfect for a beach-side home. You'll also sometimes see it on roads leading to the beach, planted in medians where it only gets Mother Nature's care and tending (and an occasional shearing by maintenance crews). This evergreen shrub is a slow to moderate grower that takes sun to partial shade. It's cold hardy and does fine in Zone 9 and southward. These plants are salt tolerant and a good choice for coastal properties. No soil amendments are necessary. However, you can add composted cow manure and organic peat moss (or top soil) to the planting hole, if you like. Trimming is a personal preference - you can keep this plant evenly sheared as a hedge shrub, lightly prune it occasionally for shape and size, or do no trimming at all. Although drought-tolerant once established, simpson's stopper does better with regular irrigation that gives the plant plenty of time to dry out between waterings. Or, after it's established, just water it well during dry spells. It can also handle areas with occasional slow drainage. No fertilizing is required, though you may want to apply a granular fertilizer in spring, summer and autumn to boost growth. Place these shrubs 3 feet apart if you're planting a hedge. If you're placing in a mixed bed, allow 4 or 5 feet between it and the next large plant. Come out from the house 3 or 4 feet if you plan to keep the plant about 6 feet tall. To let it get bigger, come out at least 5 feet or more so it will clear eaves and gutters once it matures. To plant by a walk or drive, come in about 4 feet. Simpson's stopper makes an excellent container plant and can be trained as a large bonsai. COMPANION PLANT SUGGESTIONS: Lantana, buddleia, firebush, yesterday today and tomorrow, blueberry flax lily, oleander, hibiscus, railroad vine, and sea grape.